Instilling good behaviour early in your young Jack Russell puppy's life is very important. A puppy that is given consistent guidance from an early age will grow up to be a secure, confident dog. The family should come together and agree on rules before bringing a new Jack Russell puppy home. The very same habits that are cute and adorable of a small puppy can become a source of irritation when the dog reaches adulthood. Giving of treats and food from the table. Biting on clothes, shoes and shoe laces. Licking of people's hands and faces. Jumping on family and visitors. Sleeping on beds and couches. Free running in the house. It is imperative to start informal training FROM THE FIRST DAY that you bring puppy home. The first few weeks of the puppy's life is extremely valuable to establish good behaviour and obedience. A disciplined dog will be a pleasure, not only to its owner, but also to friends and visitors. You'll never need to be ashamed of his behaviour and visitors will envy your best friend! Crate training is highly recommended. This method is becoming popular worldwide. The crate is used as a cosy bed and handy travel cage. For an adult Jack Russell, the size should be at least 55cm x 30cm x 30cm. Why do we use crate training? Crate training is an effortless and a successful method of house training your puppy. The mother teaches her litter a very important principle from birth by keeping the den spotlessly clean. The pups do their business outside the den as soon as they start wandering out. To build on the monther's principle, the crate is used for house training at his new home, much like a cot is used for a baby. 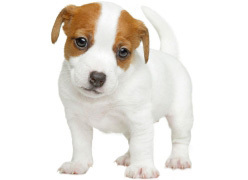 Advantages of crate training your Jack Russell puppy are many. You don't have to buy a separate bed. Pup can sleep next to your bed and is prevented from wandering off into the house, eliminating dangers such as chewing on live wires, or destroying your valuables. Crate training will also prevent your pup from establishing a habit of messing inside the house. You are able to get pup into a routine within 2 to 3 nights, so that everybody gets the rest they deserve. When used as a travelling container, the puppy also learns to behave in the car and feels secure when taken to a new environment, like the vet. The crate can be put outside in his safe playpen area when he is left home alone. However, the crate must be protected from weather elements. No water or food, it is his bed! At night you want him to sleep when it is quiet & lights are out, without whining until the early morning hours. During daytime, depending on your circumstances, your puppy should be able to have alone playtime without demanding constant company. 18:00 - Feed, wee, pooh, water, play. 19:00 - Might want to take a nap after dinner. 20:00 - Wake up - wee, pooh, drink water, play. 22:00 - Good night cuddle, into crate, lights out. 02:00 - Midnight parade - wee, pooh, water, be calm, whisper, no play, back to crate, lights out. 06:00 - Wake up - take out for wee & pooh, water, play & feed. The above is just a general indication. You and your pup will establish your own routine. As the puppy adapts to the routine, he will stretch the midnight parade towards the household wake-up time by himself. By 8-10 weeks of age he is able to stretch right through the night. First make sure all your puppy's needs are met before putting him to bed. Close the gate of the crate, then turn around and leave him to get quiet if he is moaning. If he makes a big noise in the first few days when put to bed in the crate, reprimand with a strong voice and tap on the crate every time he whines. BE FIRM. Even if you're around all day when taking your pup home, you should leave him outside on the grass, in a playpen or safe enclosed area, on his own, for short periods of time. Let him finish at least one full cycle of whining, a nap, waking up and 10-20 minutes playtime on his own every day. Only fetch him when he is content. Soon the whining will disappear. Do not fall for the temptation to run and fetch him every time he is crying. If pup is getting all the attention all the time, you will end up with a naughty, whining pup which will cause problems later on. Every time he succeeds to draw your attention with a noise, he will just make a bigger noise next time, if necessary, to get his way! When your puppy is left outside, he must be protected from severe sun, rain and wind. Crate or cosy dog house. A properly sealed wooden doghouse is warmer in winter than a plastic dome. Absorbent medium such as housebreaking training pads or news paper, to use as toilet if the playpen is placed inside or on a patio. Don't leave a gap for a wee or pooh inside the house in the first weeks. To avoid unpleasant surprises under the bed or behind the couch, your pup must sleep in his crate when inside the house. When he wakes up, he will alert you by moaning, which gives you the opportunity to take him to his toilet, teaching him the spot in the process. After his business is done, it is safe to have him play inside the house for the next 2 hours. When he cannot be supervised, he must be put outside in his playpen or safe play area. Any other time when he starts jogging and sniffing simultaneously. The Jack Russell mother reproves and instructs in two ways. By giving a quick snap if necessary. For you to successfully discipline your puppy, you need to build on the way she communicated with her puppies. You can replace the mother's growl with a strict and strong voice. You can replace her snapping by using one or two fingers, tapping him on a sensitive point, the snout. Between 6 and 8 weeks your pup must learn the command "No". You will use "NO" when he plays and bites too hard, chews on some forbidden item, whines in his crate when put to bed, hangs onto a running child's pants, etc. It's both possible and amazing to feel how a 6 weeks old pup loosens his grip with those very sharp little teeth, when the command is given! When he's doing something unacceptable, use a strong and strict tone of voice, say "No", and at the same time reprimand him with one or two fingers tapping him on the snout. He will immediately pull back, but it won't hurt him. He will quickly realise that this behaviour is unacceptable. If you are consistent, within a week you'll be able to say "No" when your puppy is out of reach, for example chewing on an exotic plant in the garden. He then will obey even when you're not close enough to reprimand physically, because he will already know what your strong, strict voice means. Immediately after you've given the commands "NO" and "COME HERE", chance your tone of voice to loving. Praise him when he reaches you, because he obeyed both commands. After the "COME HERE" command was given and the dog runs to the owner, he gets smacked for chewing the exotic plant. This is extremely confusing to your dog... In his dog mind he gets smacked because he obeyed the last command! Eventually he will not want to come to you when called, which can be disastrous when for instance, you become aware of danger and he needs to come immediately. The secret of teaching your dog commands is to keep it short! Dogs find it confusing when you give commands in sentences. However, you can have conversation (not commands) with him in sentences! He'll love that too! Always give the same short command. For example use the command "BED!" every time you put him to bed. He will associate the command with his bed and before long jump into it at the command. Examples of short commands are, Lie, Down, Come, Bed, Basket, Here, Out, Jump, Up, Catch, Fetch etc. Remember to always praise good behaviour by using a friendly and exciting tone of voice and a treat if desired. He will instantly realise that obeying brings pleasure. Your dog will love to please you. It also encourages him to obey again next time.